Promoted, maintained and confirmed by the last 3 Presidents of the French Republic, the Greater Paris project aims at making the Capital Region one of the most attractive and sustainable Global Cities, with the highest standards for quality of life and whose competitiveness challenge the major international cities. This smart and sustainable city model is built every day with the Grand Paris Makers®. Mobility operators, energy suppliers, real estate developers, digital services, but also manufacturers, entrepreneurs, craftsmen, students and researchers from all walks of life: these talents contribute to the development of the largest urban project in Europe and to the international reputation of France’s savoir-faire worldwide. Greater Paris region is the first European economic region with 660 billion euros (30% of France’s GDP). The economy of the region is diversified and based on high-end services (business services, tourism…) with many leading industrial sectors: aeronautics, aerospace, automotive, biotechnology, digital. On a global scale, Greater Paris ranks third ahead of New York for the establishment of large companies and 1st in Europe (Forbes “Fortune Global 500” ranking). First real estate market in Europe, the Greater Paris is experiencing opportunities in the perspective of the Brexit. Greater Paris is one of the three most attractive cities in the world, and is tracking London and Singapore in terms of greenfield investments (Global Cities Investment Monitor 2018, KPMG – Greater Paris Investment Agency). 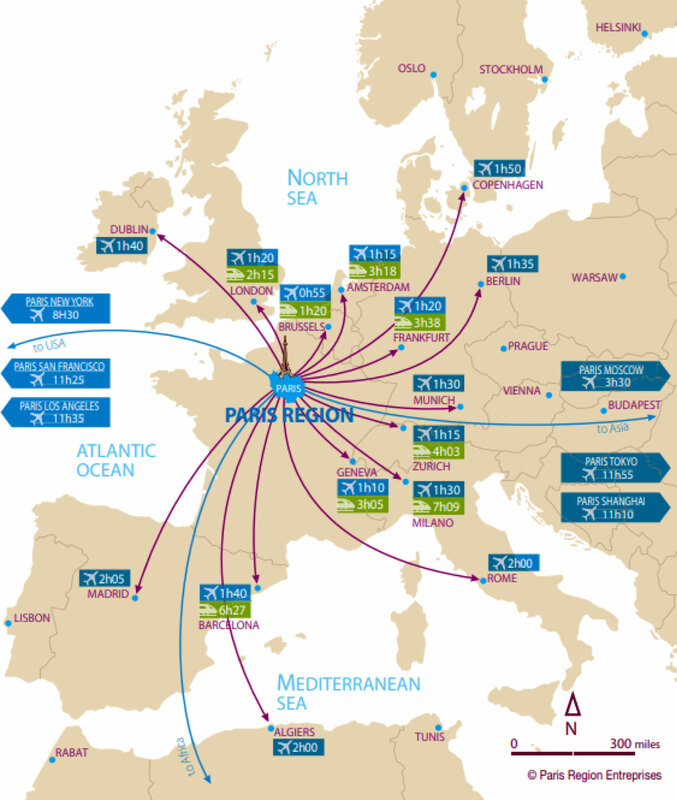 Served by 3 international airports (Roissy-Charles de Gaulle, Orly and Le Bourget), Greater Paris is a real gateway to Europe. and the major airport hub of the continent with more than 100 million passengers travelling a year. The high-performance rail and TGV network provides fast connections between major European and French cities. The regional passenger transport infrastructure (train, tramway, metro, bus) and logistics (70 urban ports) provide an exceptional network for Paris region. As a strategic infrastructure for the Greater Paris project, the Grand Paris Express will strengthen mobility between neighborhoods around the 68 new stations and support the economic and sustainable development of major activity clusters in the region. 200 km of extra automated metro lines will soon be added to the historic network and will allow fast journeys throughout the metropolitan area, without passing through Paris city centre. In order to meet the expectations of companies and the ambitious goal of building more than 80,000 housing units every year that meet the needs of Greater Paris inhabitants, many urban development projects launched in Paris and its region are shaping the face of a sustainable metropolis that innovates both in the ways of developing the city and experiencing its uses. Reinventing Paris, Inventing the Metropolis of Greater Paris, Reinventing Cities …: these innovative calls for projects will provide the Capital Region with innovative venues and iconic buildings for the 21st century. Major projects such as Europa City, Paris-Saclay and of course the hosting of the Olympic and Paralympic Games in 2024 represent a tremendous accelerator for economic, social and territorial development in Greater Paris’ districts, for clean, smart and efficient mobility and urban services. With 18 Universities and 60 schools, Greater Paris region offers courses of excellence recognized worldwide (engineering, management, research …) and welcomes nearly 678,000 students including 110,000 foreign students. Grand Paris is the leading R & D hub in Europe, ranked 3rd in the world with nearly 20 billion euros invested (40% of R & D in France) and 161,000 researchers. In order to foster cooperation between public and private institutions and reinforce innovation dynamics in applied research, competitiveness clusters bring together companies, research and training centers in sectors of excellence like digital, automotive, medicine, etc. The Capital Region hosts many campuses and events dedicated to the innovation economy. For instance, Station F, the largest incubator of startups in the world (34,000 m²) brings together a complete entrepreneurial ecosystem within the same urban campus. Greater Paris is the leading financial center in the euro zone (40% of the Eurozone capital market). It attracts international investors focusing on sustainable investments (€ 746 billion raised in 2016 in responsible finance: SRI, green bonds, etc.). Paris La Défense, Europe’s largest business district (3 million sqm of offices, 180,000 employees), is home to the headquarters and decision-making centers of the world’s largest companies. Many projects are already underway to make this business center more attractive and transform this district into a real urban living space. As the world’s leading tourist destination, Greater Paris attracts tens of millions of leisure and business tourists each year (45 million in 2017). With 700,000 sqm of conference and exhibition space, the capital has exceptional facilities to host nearly 1,000 fairs and exhibitions of international standing every year, a world record. Greater Paris has an exceptional heritage, prestigious cultural facilities and the largest number of cinemas and libraries in the world.